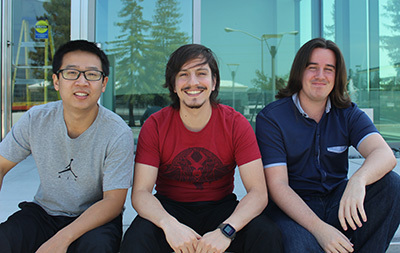 Graduate students Cong Liu, Pedro Cori, and Alex Formoso are the Trainwreck Games team. The UC Santa Cruz team won the Social Connection GameJam competition at E3 2016. A team of students in the Games and Playable Media master's program at UC Santa Cruz won $10,000 as the winner of the Social Connection GameJam, a game design competition sponsored by the AARP and the Entertainment Software Association (ESA). The competition, held in conjunction with the Electronics Entertainment Expo (E3), the world's largest computer and video game event, challenged student game designers to develop new game ideas that promote positive and sustainable social connection among users, particularly for people age 50 and older. "This is a big achievement for the team, and a significant honor for the program," said Michael John, director of the UCSC Games and Playable Media master's degree program. "We're especially pleased because the competition was outside the usual game design parameters, and the team did some impressive research on the demographic they were designing for, including their existing gaming habits, the hardware and software they typically have access to, and their motivations." The team, called Trainwreck Games, consists of graduate students Pedro Cori, Alexander Formoso, and Cong Liu. Their game proposal, Letters of Mystery, is a cooperative email-based "escape the room" adventure. Escape the room games in the physical world involve a group of players locked in a room who have to find clues and solve puzzles together to unlock the door. In Letters of Mystery, players work together in groups to complete objectives, getting clues from a server and discussing actions to take among themselves before submitting answers. The team decided that using email as a platform made the most sense for the target demographic. "Most adults over 50 use email, but they don't necessarily want to install apps or register for gaming sites," Cori said. The students also learned from their research that competitiveness tends to decrease with age, and people start to look for more intellectually challenging games. "So we came up with the idea of escape the room games, which are age-neutral, cooperative games played in groups, and thought about how we could adapt them to this medium," Cori said. They didn't have to create a working prototype for the competition, but the team did create a detailed mock-up of the game for pitching it to the judges. Letters of Mystery was a side project for the Trainwreck Games team, which has been focused on their capstone project for the master's program, a game called Ulama: Arena of the Gods. The AARP/ESA Social Connection GameJam was produced with the support of the Higher Education Video Game Alliance (HEVGA). AARP CEO Jo Ann Jenkins said games can help family and friends stay connected with one another. "The Social Connection GameJam demonstrates the innovative ways that video games foster social connections and enable us to keep in touch with each other," she said. 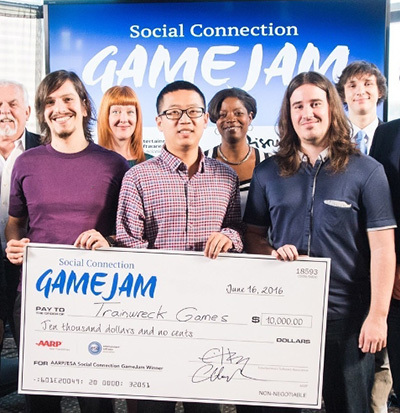 "AARP congratulates GameJam finalists for their creativity in bringing to life new games that foster social interaction." "The AARP/ESA Game Jam was an unprecedented opportunity for our industry's next generation of video game developers to push boundaries and expand the understanding of who plays video games," said Michael D. Gallagher, president and CEO of ESA, which represents the U.S. video game industry and owns E3.